Whether you need a show-stopping, sophisticated dessert or just want something easy you can make ahead of time for a special holiday dinner these Spiced Red Wine Poached Pears with Vanilla Mascarpone Whipped Cream are the solution. 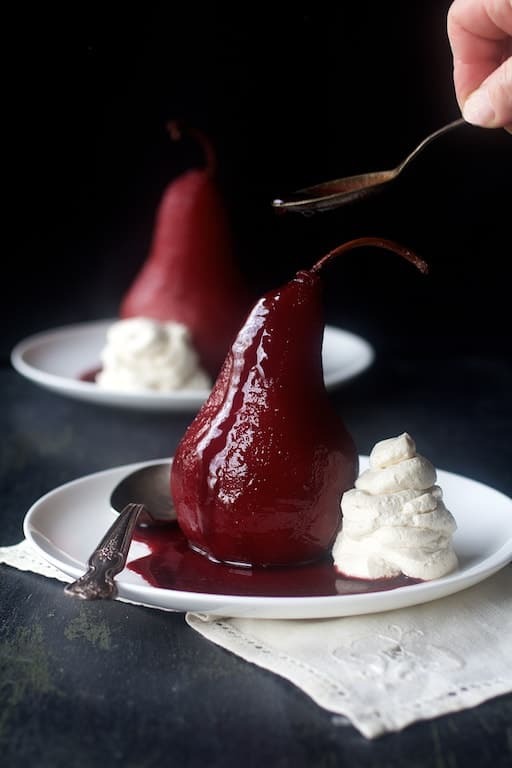 Red wine poached pears have got to be the quintessential holiday dessert! Love that they’re on the light side, too! 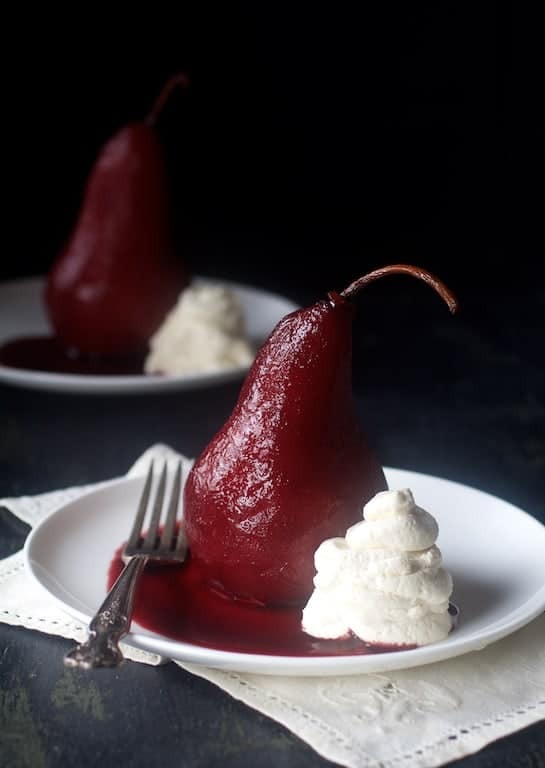 Wine-poached pears–whether in red wine or white wine–are a classic, French preparation that doesn’t require an Escoffier degree. Serving them only makes you look like you attended a French culinary school! Bosc (or Kaiser) pears are ideal for poaching because they keep their shape when cooked, however, any pear that is not overly ripe can work. Pears are the perfect ripeness for poaching when they yield slightly to pressure but are still firm. Look for pears that are free of blemishes as having to remove them can affect the appearance. When peeling them for this dish, work in long, even strokes to avoid a choppy or uneven appearance. A vegetable peeler works perfectly. You also want to be careful not to bruise them. It’s important to periodically turn the pears while they’re poaching to ensure even cooking and a consistent ruby-red color. You also want to turn them occasionally while they’re cooling in the red wine mixture because they continue to soak up the mixture. I served with a simple vanilla mascarpone whipped cream. For less work, gently heat them back up in the poaching liquid and serve warm with vanilla ice cream. Oh, and a quick etiquette tip…. Be sure to give your guests both a fork AND a spoon to enjoy this dessert–a fork to help secure the pear and the spoon to eat it with. If you have any pears left over, serve them on a salad such as my Winter Greens with Poached Pears, Butter and Turbinado Toasted Almonds, Blue Cheese and Balsamic Vinaigrette. Looks beautiful! Can these be prepared on a Sunday, frozen, and heated up for Thanksgiving on Thursday? Hi, Meia, Thanks so much for your question. I would not freeze them as they would get mushy after thawing. I actually think they’d be okay for four days. Hope you enjoy! Oh, okay! So you would just follow the recipe all the way through and then put them in the fridge in a Tupperware in the fridge and take them out Thanksgiving day? Making them closer to Thanksgiving would be ideal but if you simply can not, just keep them refrigerated. Be sure to start with firm pears so they hold up. Here’s a whole article with detailed from David Lebovitz. He said poached pears should keep up to five days. https://www.davidlebovitz.com/how-to-make-poached-pears/ Thanks again! I doubled the recipe for the sauce and poached 7 pears. I have leftover syrup that I will use over ice cream, or maybe even in cocktails …it’s unbelievably delicious! Hi, Erica, Your party sounds like crazy fun! I think the leftover sauce would be amazing over ice cream or in a cocktail. Thanks so much and so glad you enjoyed! Hi there – do you think it would be possible to do a large batch of these in the oven? I’m thinking, 40 pears for a party. Thank you! Hi, Rachel, Thanks for your great question! Wow. That’s going to be a lot of pears to peel! Yes, you can do poached pears in the oven. 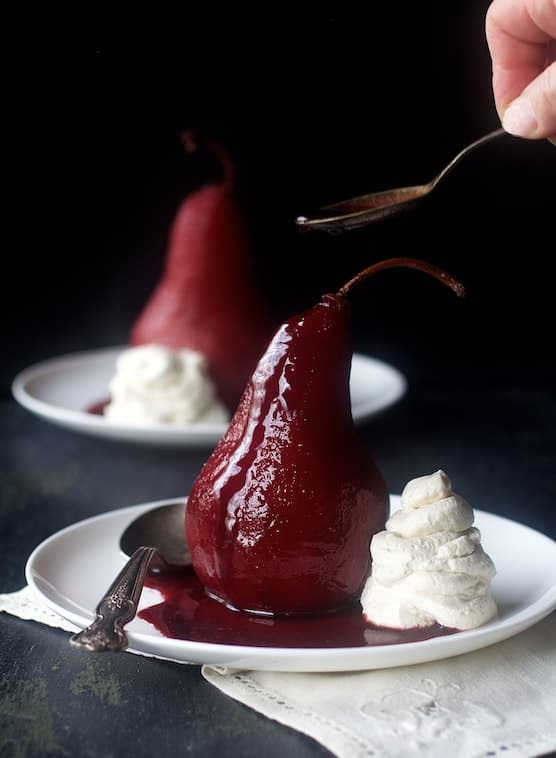 Here’s some information from the New York Times: https://cooking.nytimes.com/recipes/457-oven-poached-pears-with-red-wine I’d love to know how it goes. Thanks again! Can I make this recipe the night before? And how do I store it? Hi, Caroline, Thanks so much for your question. You absolutely can make it the night before. Cool in the syrup, turning the pears occasionally as they continue to soak up the sauce. As soon as you get up in the morning, turn the pears again as you want the color as even as possible. Store in the refrigerator overnight and bring to room temperature. Hope you enjoy and Happy Holidays! If I want to make this recipe for 6 pers, should I triple the recipe? Ellie Krueger used only two cups of red wine for four servings. I didn’t think that was enough. It’s up to you how much sauce you want. If you have any left over, it’s great over vanilla ice cream.. These look beautiful and I would love to serve for Christmas. Can this recipe simply be doubled to serve 4? Ellie Krueger only used two cups of red wine for four servings. I didn’t think that was enough so you should be fine adding two more pears. It’s up to you how much sauce you want. If you have any left over, serve over ice cream. Poached pears are my absolute favorites. Well done, the flavors are simple, but complement each other so well! Thank you so much, Oana! Please stay in touch!